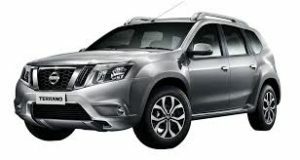 Nissan has launched the facelift Terrano in India today. The updated SUV gets minimal changes to the exterior while inside is where one will find the maximum number of changes. The Terrano was launched in India back in 2013 and based on the same platform which Renault uses to underpin their Duster SUV as well. The updated Terrano get 22 brand new features which have been provided to strengthen the SUV’s smarter and bolder appeal to customers. The Nissan Terrano shares the same engine lineup that includes 1.6-litre petrol and 1.5-litre k9k diesel engines. The 1.5-litre diesel engine is offered in two states of tune like the Duster, producing 85 PS, 200 Nm and 110 PS, 248 Nm respectively. On our media drive in Udaipur we got to test both the 1.5-litre diesel engine variants. The Renault sourced 1.5-litre k9k diesel engine is a gem and both 85 PS and 110 PS versions have their own merits. The 85 PS diesel gets the hold of power immediately with a fractional amount of turbo lag. It provides continual power delivery right from the word go until the mid-range, post which the power starts fading away. This particular setup is ideal for city driving conditions where you need initial and mid-range grunt. The engine feels lively from a low 1200 RPM till 3500 RPM. Above 4000 RPM the power feels inflexible. Coming to the 110 PS diesel, the turbo lag ailment is there being a thick one until 2000 RPM, post which the turbo kicks in and you get a good boost of twisting power with some torque steer. The torque wave is enjoyable to ride on once you get used to the gear ratios and maintain your gearshifts within the turbo zone. The real action lies in the mid and top range of the rev band, which makes the 110 PS Terrano a terrific highway cruiser. The engine feels creamy throughout the range with top notch refinement. The 1.5-litre engine enjoys revving up to 5000 RPM. Mated to the 110 PS version is a 6-speed manual gearbox. It is a rather long legged transmission, which is very convenient on the highways. At 100 km/hr in sixth gear the engine spins around 2200 RPM being in the turbo band, which means the car has relaxed cruising ability with enough grunt for high speed overtaking. There is no need to downshift for overtaking trucks as far as you are in the turbo zone. On the flip side, the engine needs to be learnt for city driving and steep incline sections. The initial turbo lag has to be treated with frequent downshifts otherwise you tend to do clutch slips. The clutch operation feels a bit stiff, which adds to the hectic drivability in congested traffic but it’s not a deal breaker as you would enjoy this engine once you get a hang of it. The Terrano doesn’t really offer anything over the Duster besides the significant styling differences. However we believe the Terrano will be well received because it’s a handsome and more premium looking design and will appeal to those who think the Duster has become a little pass. The significantly tweaked visuals and similar kit should be incentive enough to spend what we believe will be Rs 50,000 to 70,000 more than the equivalent Duster. Nissan will start taking pre-sales bookings from the first of September while the car will officially go on sale in October during the festival season. The compact SUV segment just got a hot new player.